Rightline Gear Car Clips – Proper Fit? 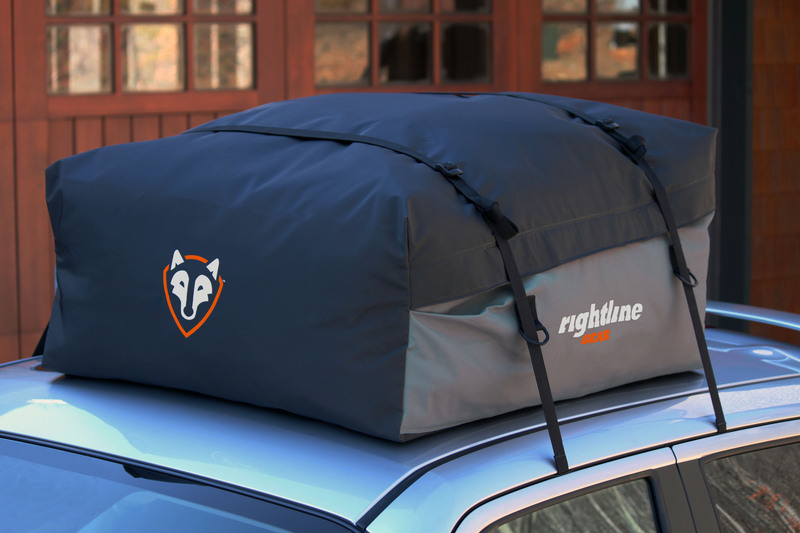 The Rightline Gear Car Clips allow you to attach any of our roof top cargo bags to vehicles WITHOUT a roof rack. The Car Clips are added to the ends of the cargo bag’s standard straps. The straps then clip under the door frame weather molding on one side of the vehicle and run over the cargo bag to clip under the door frame weather molding on the other side of the vehicle. The tension on the strap between the two clips holds the cargo bag in place. We have tried the Car Clips on a huge number of vehicles and have found them to work on 99% of them*. Every once in a while, we get a call from a customer expressing that the Car Clips don’t work on their particular vehicle. It seems that more than one customer is running into the same trouble, so we thought we would address it here. The Problem: The Car Clips pop out from behind the door frame weather molding when the vehicle door is closed. The Solution: Simply make sure that the strap holding the Clip has enough tension on it. Tighten the strap at its buckle or pull it tight by hand before closing the vehicle door. 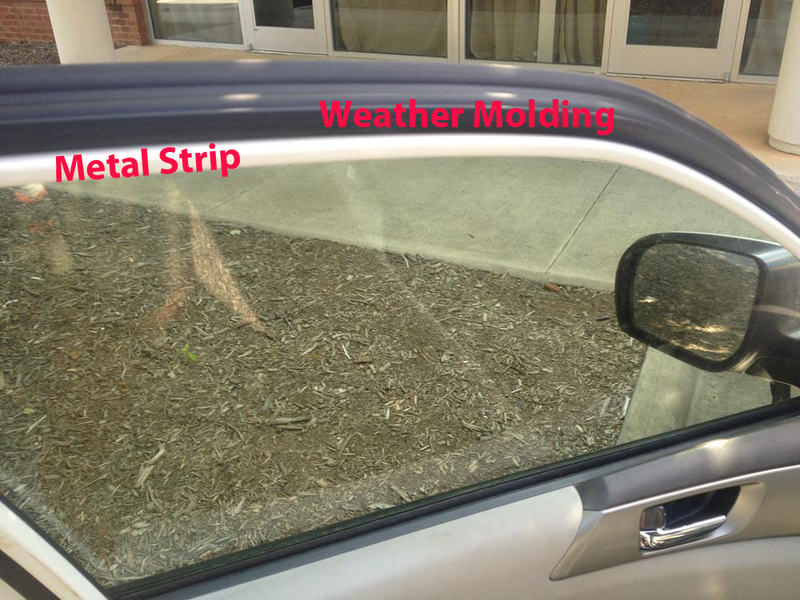 More Detail: The doors of most vehicles have a metal strip below their weather molding. This metal strip is designed to come into contact with the door frame weather molding when the door is closed. 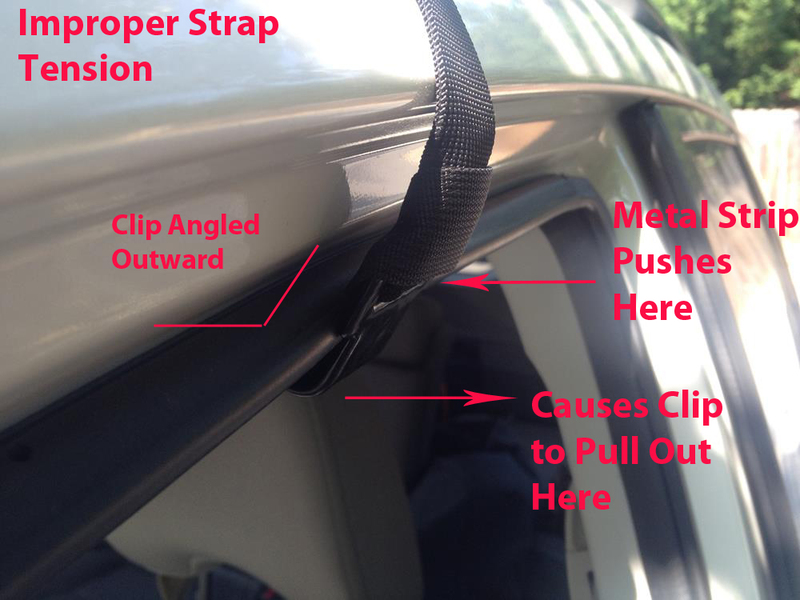 When a Car Clip is in place and the vehicle door is closed, the metal strip of the door will come in contact with the Car Clip (at least a small amount). The point of contact is normally at the top of the Car Clip where the strap is threaded through. 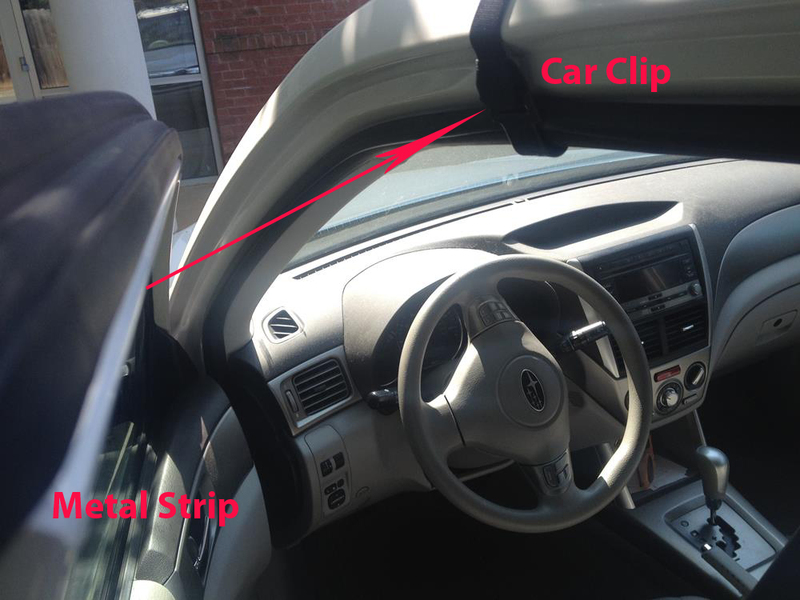 If the strap is not at the proper tension, the top of the Car Clip will angle outward from the door frame. When the door closes, the metal strip of the door will push on the top of the Car Clip, causing a torquing action that pulls the Clip out from behind the door frame weather molding. If the proper tension is on the strap, the top of the Car Clip will be straight up and down (not angled outward from the door frame). 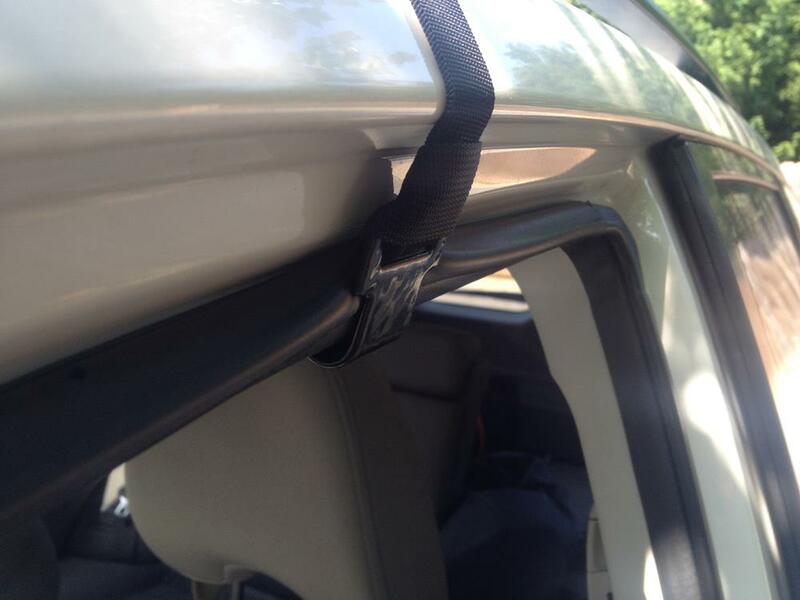 When the door closes, the metal strip of the door will come in contact with the top of the Car Clip, but no torquing action will occur – it will stay in place. It is that simple. Once you get the feel for the proper tension of the straps, this problem should be completely eliminated. Please contact Rightline Gear with any questions. * The only exceptions are vehicles without metal frames and weather molding around the top of their door windows and mini-vans with sliding doors. This entry was posted in Car Top Carrier Tips. Bookmark the permalink. 28 Responses to Rightline Gear Car Clips – Proper Fit? I have a 2007 Mazda 5 with sliding doors. The comment at the end of the post – does that mean that the clips won’t work if there are any sliding doors, or is there a different trick for sliding doors? Ben, yes, the clips will not work with any sliding doors. The door will run into the strap that is attached to the clip and push it forward as the door closes. Our Cargo Saddlebag is the only solution out there for minivans without a roof rack and sliding doors. Please let us know if you have any questions about the Saddlebag. does the rightline sport jr cargo carrier fit on 2-door cars, particularly the Fiat 500? Our Sport Jr. is an ideal Car Top Carrier for many compact 2-door cars. While we are unable to test our carriers with every vehicle make/model on the market, we have tested that the Sport Jr. will fit many compact cars such as the Chevy Sonic, Ford Fiesta, and Toyota Prius. To ensure a proper fit, we always recommend measuring your rooftop first and giving us a call with the dimensions. We just bought a 2016 Toyota Camry and want to know if the Rightline Gear Car Clips will fit since we don’t have a roof rack. The Car Clips should fit the Camry without any difficulty. Will these fit even tho there isn’t a metal lip at the top of the door opening? The clips attach to the rubber molding inside the door frame of your vehicle, not to a metal lip. clips do you have a door clip, that would work, on a late model Corvettes ? Bob, the Rightline Gear Car Clips are designed to work with vehicles which have a metal door frame around the top of their door windows. As Corvettes do not have a metal door frame around the top of their windows we cannot recommend using the Car Clips with your Corvette. However, you are still able to use any of our car top carriers without a roof rack by routing the straps through your vehicle and up over the top of the bags. Detailed instructions for how to do this are included with the carriers. I have 2016 ford edge. Will these work? Mark, the Car Clips should fit your Ford Edge without issue. Have you had any postive or negative experience with the Ford C-max? If the Ford C-Max uses sliding rear doors we cannot recommend using our Car Clips as the sliding door interferes with the clip’s attachment. If the C-Max does not have sliding doors we are confident the Car Clips will work. For additional questions please contact us at 888.685.GEAR. Will the clips work with my 2013 Hyundai Sante Fe? Hello. The Car Clips will fit a 2013 Hyundai Santa Fe without issue. I have a 2011 Camry Hybrid. Will the car clips work on it? Hello. The Car Clips will fit your Toyota Camry without issue. Hello. The Car Clips will fit a 2013 Toyota Camry. We have a 2017 Hyundai Santa Fe Sport. The weather molding is flush with the car and there is nothing to clip to, or around. What is the solution? Thank you. Hello Betsy. We are confident the Car Clips will fit your Hyundai. Please contact our customer service team at 888.685.GEAR and we are happy to walk you through their installation. What is the inner diameter of the curved part of the clip? With regard to the Sport 1 car top carrier – will the car clips fit a 4 door toyota echo sedan? Hello. The inner diameter of the curved portion of the Car Clips is roughly 10mm. Please contact us at 888.685.GEAR for any additional questions. Hello. The Car Clips will fit your Toyota Echo so long as your doors have a metal frame and weather molding around the vehicles windows. The Car Clips do not work on vehicles with frameless doors. For additional questions please contact us at 888.685.GEAR. I just got one for our 2004 Toyota Prius, and it doesn’t seem to hold anywhere — am I doing it wrong, or will it work? Hello. We are confident the Car Clips will work on your Prius. We have first-hand tried the Car Clips on this vehicle. Please give us a call at 888.685.GEAR and we are happy to walk you through the installation.